As a researcher at a leading global environmental think-tank, I have spent most of my career persuading policymakers around the world to act to protect the environment. One of the biggest barriers to solving many contemporary environmental issues is our unwillingness to change our lifestyles. This stubbornness is jeopardising the planet both for our children and future generations. Children growing up today will face the consequences of a changing climate. Temperatures are increasing on the land and in the ocean, the sea level is rising, and quantities of snow and ice are diminishing as greenhouse gas emissions and concentrations have increased. The impact we are making on our climate is clear. If we fail to take further action soon, we risk profound disruption to all levels of society and the natural world. We need to prepare children for future climate change - from natural disasters to the creeping effects of rising sea levels and changing rainfall patterns. Given the size of the challenge, it is surprising how little coverage there is in children's fiction of green issues, and particularly of climate change. To some extent, this reflects the attention given to environmental issues in broader society. Our interest in the environment waxes and wanes with economic and political cycles. In a recession, green issues fall down the political and public agenda. The current dominance of Brexit and the climate-sceptical stance of the US are further distracting our attention from the urgency of the problem. One of the first books that conveyed ecological destruction to young children was Dr Seuss's The Lorax, published in 1971 - one year after the first Earth Day. The book highlighted the division between business and environment. Recent eco-themed books include Oliver Jeffers' non-fiction picture book Here We Are: Notes for Living on Planet Earth, which provides young readers with a succinct tour of the planet. Piers Today's Last Wild trilogy paints a futuristic picture of a world ravaged by humans. Saci Lloyd's The Carbon Dairies uses an engaging narrator to consider the effects of climate change. Stories play a part in how children perceive the world. Imaginative characters can be used to highlight our role in protecting the planet. However, climate fiction aimed at children, especially young adults, has presented a dystopian future. While this may be an accurate prediction, it is important to offer children a message of hope to inspire them to take action. I never intended to write an eco-themed book, but given my background it seemed the most natural thing to do. My Dad, the Earth Warrior is a story about the relationship between a boy called Hero and his Dad, who have grown apart since the death of his mother. One day, Dad has a freak accident and wakes up claiming to be an earth warrior sent to protect Mother Earth. This plunges Hero into an increasingly bizarre and dangerous world. The earth warrior provides an alternative perspective on our relationship with the natural world. At the end of the book, I encourage all readers to join the tribe and become earth warriors. I hope that by taking a humorous approach to a serious topic, I can not only engage and entertain children but inspire them to think beyond the book. Children will be responsible for the future protection of our fragile plant, so their knowledge and engagement are critical. We need them to care if they are to address the environmental challenges that lie ahead. In the words of the Lorax: "Unless someone... cares a whole awful lot, nothing is going to get better. It's not." Gary Haq is an earth warrior whose day job is saving the planet. He is an associate researcher at a prestigious global environmental think tank and a research scientist at a European research centre. When he's not involved in his own eco-adventures, he likes to write, read, learn languages and explore new cultures. 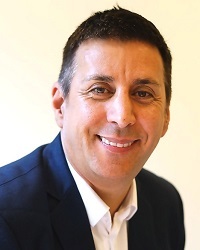 Gary lives with his wife and young daughter, and spends his time between York, England and Laveno, Italy. 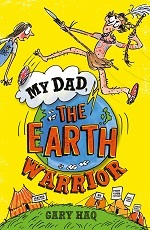 My Dad, the Earth Warrior (Gazzimodo) is his first children's book, and is available in paperback, ebook and audiobook.